Fig. 2 RFLP analysis of c-kit. 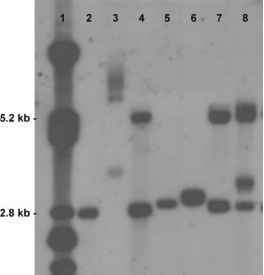 After amplification of the mutation-containing region of the c-kit cDNA, PCR products were digested with Hinfi and analyzed by electrophoresis on a polyacrylamide gel. Compared to WT c-kit (1), the c-kit D816V mutation (2) generates a second restriction site for the endonuclease Hinfl within the amplified region. Predicted sizes for the WT sequence are 150 and 56 bp, and are 150, 42, and 14 bp for the mutated sequence.